Designed as a result of intensive collaboration with our clients, our harvesters and shakers provide a highly efficient method of gathering crops. They reduce the previous high labour ratios, thus lowering harvesting costs. Especially intended for olive and almond harvesting, our new shaker head is included with all Afron Harvester machines and can be mounted as a Kit on 75 hp tractors. 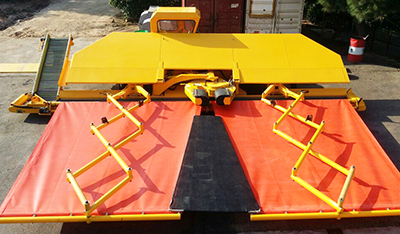 We also offer a self-propelled apparatus which collects the fruit and stores it in a hopper. This is presented in one or two piece models.